What Are The Benefits of Having Tenant Representation and how can it Affect your Company? Office space is one of the most meaningful and influential decisions for a company’s executive. Depending on the size of the requirement, it may take months (or even years) to identify a space, negotiate deal and lease terms, construct the premises, furnish the space and move. Well planned office spaces help to create corporate culture, attract talented employees, foster relationships amongst co-workers, and showcases a company’s operations to their clients. Although many executives believe that they can achieve an economical deal, on their own and without any representation, it is often not the case. In New York City, the typical office lease duration is somewhere between five and ten years. Accordingly, over a 30 year career, the typical executive might handle a real estate process three to six times; assuming that there is only one location. Though this might seem like enough experience to handle the assignment, he/she lacks the information necessary to achieve “market” real estate concessions. For instance, how many months of free rent are typical on a 5 year lease? How about build-out allowance or construction costs? What is the typical security deposit on a 5 year deal? Does the company need any options (i.e. termination right, expansion option, renewal option, etc.)? A deal is comprised of many other aspects besides base rent. All New York City landlords have a comprehensive knowledge of these components. Additionally, they realize that the typical office space user is not savvy enough to negotiation on their own behalf. The landlord and their representation, will seek to get the most favorable economics in an effort to maximize their asset’s value. Hiring a knowledgeable exclusive tenant representative will ensure that the fairest market deal is achieved. Does negotiating a lease directly with a landlord or management company create a conflict of interest? Yes. Executives are in the business of running their companies and overseeing daily operations. They are not office leasing experts and do not follow the market as closely as real estate professionals. When negotiating directly with a landlord/managing company there is clearly an unfair advantage. As a decision maker, how do I mitigate this unfair advantage? By engaging the services of a competent tenant representative, an operating principal can create leverage in a negotiation. Informing a landlord that a tenant is professionally represented creates natural competition. The landlord understands that the user is educated on alternative sites, comparable lease rates, market concessions, etc. As an added benefit, a tenant rep may be familiar with the temperament of a particular landlord and/or landlord’s representative, and recognize how far to push the negotiations without jeopardizing the transaction. What are the standard fees associated with hiring a tenant representative? Will it cost my firm more money? There are no fees associated with hiring representation. However, there is a common misconception that engaging a tenant rep will increase the rent. This is absolutely untrue, stemming from the belief that the landlord tacks the commission fee on top of the asking rent and would rather do a deal in-house. The landlord builds a standard commission fee into the asking rent regardless of whether a tenant has their own representation or does a deal directly with the management company. The only difference is whether or not the fee will get split amongst the brokers. Who is the largest tenant representation firm? Studley is the largest tenant representation firm in the world. With over 500 brokers nationwide and international capabilities, we are the industry leaders. Most of our competitors derive the vast majority of their income’s representing and servicing landlords. As one can imagine, this creates an inherent conflict of interest. It is much more lucrative to “buddy up” with a landlord and do continuous deals than to represent a tenant once every 3, 5, 7 or 10 years. We eliminate this inherent conflict of interest by ONLY representing tenants. 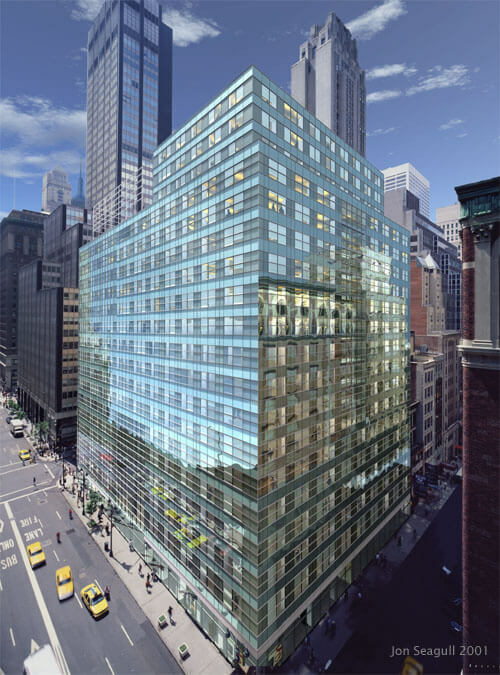 Looking for office space in New York City? Click here for a free Commercial Real Estate Search and Office.